I’m reading Sebastian Barry’s The Secret Scripture at the moment- borrowed from Trish (thank you Trish!) and short-listed for the Booker Prize. And here I am, reading away, thoroughly enjoying it all when all of a sudden the REAL Resident Judge of Port Phillip- John Walpole Willis- comes bursting into the story! Well, not so much him as his son, also named John. The main character of the book, Roseanne, is a 100 year old woman, who has been incarcerated in an asylum for longer than anyone can remember. Her psychiatrist, Dr Grene, comes into her room and picks up a book that used to belong to her father. Ah- but J. W. Willis Bund hasn’t been forgotten- or at least his father hasn’t been. They have been pursued all the way to Worcestershire by a woman from Melbourne, in the district of Port Phillip, Australia! And here she is (looking suitably maniacal) in the small local church in Powick, near the Wick Episcopi estate- found them at last! So who was J. W. Willis Bund? He was born at Valparaiso (the usual stopping place on the western South American coast for ships returning from Australia to England), on the trip home from Port Phillip, after his father, John Walpole Willis, the Resident Judge of Port Phillip had been removed from office in 1843. His mother was the daughter and heiress of Colonel Bund who lived at Wick Episocopi in Worcestershire, and on return from Port Phillip, Judge Willis and his family lived there on the maternal family estate too. 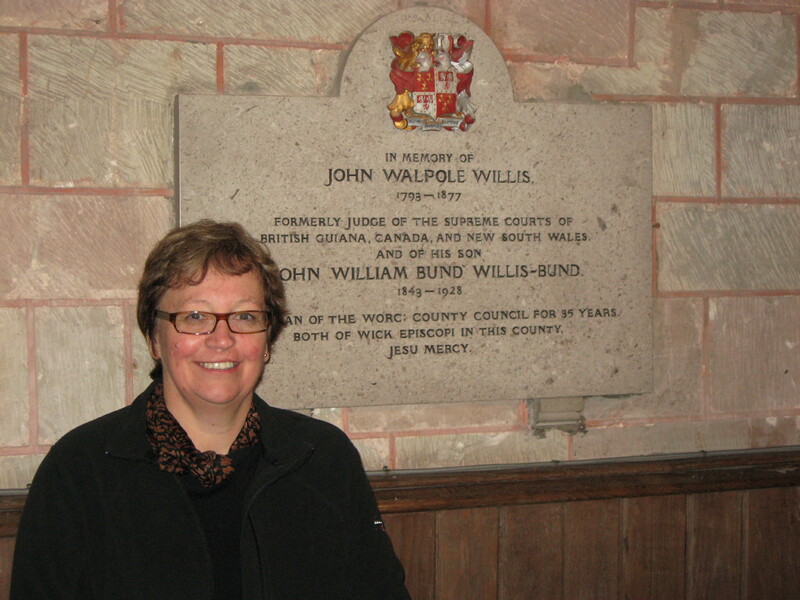 In order to inherit the estate, it was necessary for Judge Willis’ son to take his mother’s name as well- hence the Willis Bund (although the Bund Willis Bund seems a trifle excessive). He was prominent in local affairs in Worcestershire: he sat on the County council, he established the local historical society, and he was a prolific historian and writer. And yes, he did write the foreword to the Religio Medici mentioned in Sebastian Barry’s book. On Wednesday, one of the scenes which occur so frequently in this town and which tends to exemplify so strongly the dogma frequently advanced, that a great portion of the Emigrants landed on these shores are immoral, was to be witnessed in King street. A female of rather prepossessing appearance, who arrived a short time since as an emigrant, was proceeding towards the Flag-staff enjoying the serenity of the morning in the company of a tall moustached being of the male gender. Arm in arm the parties progressed along the streets now and then exchanging sundry symptoms of mutual affection. Unfortunately however for the equanimity of all parties concerned, the scene was destined soon to be interrupted. There was seen to advance from a contrary direction a two legged animal, one of that species expressively denominated “a man” but what kind of one our readers will soon learn. A creature about four feet nothing, whose body was any thing but resembling that of our Melbourne Falstaff, whose frontispiece was a conglomeration of parts, more appropriate to the frame of larger beings. With rapid but not extensive strides the little man sidled along, till a walk was changed to a run. Fire flashed from his eyes and fury from his mouth, on a near approach to the loving couple, his feelings found vent in the following expressive words, “What! is it to be a witness of this, that I have come to Australia, to see my wife the leman of a false and ignorant puppy, oh! would that I was in England, I would have justice, but here these things are fashionable, and I am to be a miserable being for the rest of my existence; oh! villian I will be revenged.” A storm of words ensued, rapid as the gushing torrent, abuse fell from one party, and threats of vengeance from another, which at length was ended by the man wot wore the moustachios saying, “what! is it a diminutive creature like you that dares insult me in the street and endeavour to force from my society a lady; begone!” Actions followed fast upon the words, the little man was seized, raised aloft, and hurled with impetuosity into one of those clean spots with which Melbourne abounds. During the scene, the lady gave vent to her feelings in tears, but on the completion of the above mentioned feat of bravery, she seized the arm of her chere amie and hurried him affectionately from the spot, leaving her husband bruised, and injured both in body and mind, to console himself as he best might. 1. Although there are often descriptions of street scenes in the newspapers, there are very few describing women. Where a woman appears at all, it is often a 2 or 3 line description of some accident and misadventure befalling her. In fact, this is the only lengthy article of its type that I have found, where there is mention of public affection between a man and a woman, and where she seems to have some (albeit limited) agency in the episode. 2. It takes place in King Street, near Flagstaff Hill. In the early 1840s, the centre of Melbourne was located more to the west than it is today, in the square roughly bounded by King, Lonsdale, Elizabeth and Flinders Lane, with a concentration around Market Steet and Collins Street. By walking up King Street to the Flagstaff Hill, they were walking out of the city up to its highest point- the Flagstaff- where flags were displayed showing the ships that had come into harbour. 3. There’s moral judgements at work here. Moustaches were viewed with some suspicion- certainly Judge Willis castigated the “dandified solicitor” Edward Sewell for wearing a moustache in his courtroom. The public displays of affection would be frowned upon by respectable readers, and the description of the woman as “prepossessing” is ambiguous. The language also slips between “female” and “lady”, suggesting uncertainty about her social status. 4. The article as a whole reflects the anxiety that Port Phillip inhabitants felt about emigrants. While rejoicing in the fact that Port Phillip was not a convict settlement, the inhabitants – or at least the Port Phillip Herald- remonstrated when too many emigrant ships arrived at one time, particularly when their passengers embarked into an economic situation of unemployment and insolvency. There were criticisms of the emigrants who hung around the emigrant tents for too long, disdainful of wages that they felt were too low- the 1840s version of “dole bludger”. In particular, there was anxiety over unaccompanied female emigrants. In general emigrants were encouraged to go ‘up country’ as soon as possible to work as farm labourers or domestic servants. At the same time, though, the growth of the economy depended on the influx of new settlers and their demands for housing and consumer goods. Come to think of it, I think I hear echoes of the debate about Melbourne’s growth today….. Lest you think I do absolutely no work on my thesis at all, last night I finished reading Bruce Kercher’s ‘An Unruly Child’. The blurb on the back of the book describes it as “a provocative re-examination of our legal history, appearing at a time when Australians are reconsidering both their past and their future”. Kercher’s intent is to critique the official view as taught to law students that Australian law is English law with minor adaptations to meet local circumstances. His book examines the contest over the nature of the law in Australia, the struggle between local and imperial officials, and between popular ideas and the official law. Kercher probably leans towards John Hirst’s view that right from its inception, the NSW colony developed practices that subverted imperial intentions for a purely penal society. He argues that particularly between the introduction of the Supreme Court in the 1823 NSW Act, (and even more in the 1828 Australian Courts Act), and the mid-19th century, there was a period in which colonial law officers were authorized and even encouraged to consider the applicability of English law to local conditions, and to modify it where necessary. More liberal judges embraced this opportunity: more conservative judges resisted it. At the same time, colonists themselves subverted legislation that hampered them- for example, squatters in the Legislative Council protected their privilege and opportunities for expansion through the Squatting Acts; they insisted on Bushranger Acts that have some parallels with anti-terror legislation today, and in some regards e.g. insolvency legislation, Australian colonial legislation predated changes made in later decades to English law. John Walpole Willis is mentioned in this book, but is given less consideration than Montagu in Van Diemens Land and in particular Boothby in South Australia- the two other “bad boy” Australian colonial judges. Possibly Montagu’s actions were more overtly intransigent or complicated by financial scandal, while Boothby in the 1860s was an anachronism in post-responsible-government times. As with so much with Willis, I’m still not absolutely sure that he fits entirely into a ‘conservative’ pigeon-hole. But as Kercher points out, conservative and liberal legal beliefs could have ironic consequences. For example, the ‘liberal’ Francis Forbes quelled his misgivings over the highly repressive bushranger legislation because he strongly supported local law making powers, while the ‘conservative’ William Burton imposed the death sentence on white attackers at the Myall Creek massacre in a radical letter-of-the-law interpretation that outraged white settlers. As Kercher notes “Liberalism and conservatism did not always have predictable results” (p.107). Sometimes the Resident Judge feels very Antipodean and well, rather ignorant. When reading this book, for instance. I’d heard about it on Radio National’s Book Show and, having recently read and enjoyed Victoria Glendinning’s Vita, and David Cannadine’s Aspects of Aristocracy, I thought I’d enjoy this. And hey- I gobbled up Mary Lovell’s The Mitford Girls, I swooned over the Brideshead Revisited series years ago (which is on the top of the to-be-read list) and have read a Woolf or two or three in my time. So, I thought I’d know enough about the Bright Young People to embark upon this book. Obviously I don’t know as much as I thought I did. To be honest, I gleaned far more from the reviews and the interview with the author on the Book Show than I did from the book itself. Perhaps the physical aspects of this particular copy were the first problem. I could only find it in Large Print format at any of the libraries I frequent, which in itself is interesting- it was in the Outreach Van which goes round to all the aged-care homes where, no doubt, is where Bright Young People are now. It is available in hard-back, but at $65.00- well….. I found it rather hard to take a book in Large Print seriously. I felt Nanna-ish while I was reading it, and infantalized in a way. There were very few pictures in the book, and those that it did have were of very poor quality. If ever a group of people called out for photographs, the Bright Young People did! They were the celebrities of the 1920s, floridly material and consumeristic and highly visible. As it happens, I’d just been to see the Art Deco exhibition at the National Gallery of Victoria, and I rued even more the paucity of photographs of people and material culture in this book. And so many names! and for me, that’s all they were- names. I really needed a cast-list at the front of the book with little potted biographies- a sentence or two would do, and a damned good index at the back. Alas- neither of these were provided, although there was a curious mock gossip column at the start that introduced the names that the reader was about to encounter throughout the book. But, clever though it was, it lost all effect as it was just as fleeting and cursory as the rest of the book was: an exercise in name-dropping, and I gained far more from it when I returned to it after finishing the book. Likewise, some chapters had a little vignette attached where one of the Bright Young People was discussed in more detail. But the titles of these vignettes did not always correlate intuitively with the person being discussed, so that you couldn’t locate the vignette in the table of contents and turn to it easily. They were spaced throughout the text, and you would often encounter a character many, many times before he or she was finally dealt with in a vignette. Without an index you couldn’t go back to re-read the information offered up previously that had, at last, been contextualized and integrated into the vignette. For me, this was a book deeply flawed by structural elements, and my reading was hampered by lack of background knowledge. And so, I was rather surprised when reading reviews of the book, that I had actually understood much more than I realised I had during the act of reading. Yesterday I googled around on some of the main characters that Taylor deals with in this book (e.g. Brian Howard, Eddy Gathorne-Hardy) and realised that nearly all of the names were now familiar to me, thanks to this book. The Bright Young People knew who they were, and they knew who were the imposters too. They were the generation that ‘came out’ in the immediate Post World War I era, the younger siblings of the mourned generation of WWI. They congregated around Mayfair, and were well connected either through establishment or artistic ties. Caught demographically between WWI and the Depression/WWII, they existed in a self-obsessed little bubble in the 1920s, feeding on the wealth of their families or thriving in the media and technology of the time. 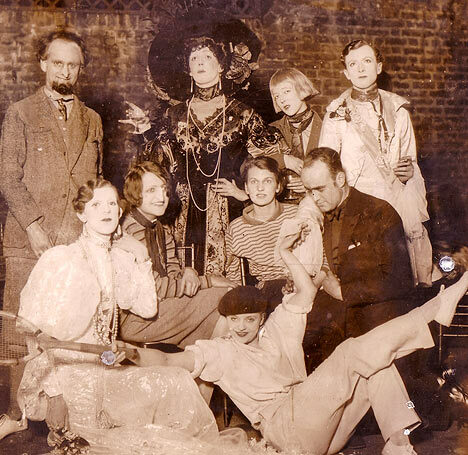 Many of their activities were flamboyant and self-indulgent: scavenger hunts through the Establishment buildings of London, weekend country-house parties swilled away in alcohol and drugs, fancy dress and theme parties- and consumption, consumption, consumption. The Wall Street crash seemed to have escaped their interest, but by the 1930s their profligacy in the face of the Depression became unconscionable and they began to respond more to the politics of the day- either Communist and caught up in the Spanish Civil War, or fascist (e.g. Diana Mosely) and strongly supportive of the Blackshirts. Then came World War II and the Bright Young People were bright no more. There were many resonances with the current cult of personality : Brenda Dean Paul died a heroin addict in a life not unlike Britney Spears’; and there was the symbiotic love-hate relationship with the media which both employed and execrated the Bright Young People. Many of the young men were homosexual. Drug-taking and alcohol abounded. Parents despaired of the flippancy and extravagance of their infantilized children who didn’t go to bed until 5.00 a.m. and seemed to think that the whole world existed just for their amusement. The emotional heart of the book probably lies in the material that the author has gleaned from the unpublished diaries of the parents of Elizabeth Ponsonby (pictured above). Her father was a politician employed on a parliamentary salary which could barely stretch to cover his daughter’s extravagance. He, and his wife, watched on aghast and yet always loving, as their daughter abused their income, home and support. Other sources for the book included letters between Bright Young People, newspaper reports and extracts from novels written by Bright Young People about Bright Young People. There’s always a peril in using novel extracts – especially if they are as ephemeral as some of these novels and novelists were: an extract might resonate if you happen to have read the book, but otherwise it’s a bit like overhearing someone else’s conversation. So, an unusual reading experience for me. I found it a frustrating difficult read, and yet I gained far more than I realized I did. For Better or For Worse? Probably worse…. Oh no! I can’t believe it! For Better and For Worse, the daily cartoon strip that I have been following for all my adult life has finished!!! I’ve had my children with this cartoon strip!! Like Elly, I despair at the changes that are happening to my body without my permission!! I hated Deanna’s mother Myra with a vengeance!! What a good wife Iris has been to Grandpa Jim, somehow leaving space for them both to honour their now-deceased first spouses!! I was so pleased for Michael getting his book published, and so distressed when their house burnt down!! Dang it, I cried when the dog died rescuing baby April from the rushing stream!! Much as enjoy a good wedding, though, Elizabeth and Anthony’s wedding day was dragging on a bit. I had it all worked out- Elizabeth and Anthony were going to rush from the wedding service to Grandpa Jim’s hospital bedside when they heard about his heart attack (I was right, they did); he was going to wake from his semi-coma and see her in Grandma Marion’s wedding dress ( I was right, he did that too), then he was going to cark it right then and there (he didn’t). But finished?? Is April going to settle down and become a vet after all? Will Deanna and Michael have another baby for their country? Will Elizabeth have a baby with Anthony? How will she get on with her step-daughter? When will Grandpa Jim finally cark it then? Wait! hold on…. there’s a follow up page that finishes off all the stories. Lynne Johnston, the creator is going back to the beginning and starting again. Oh no. Bad idea. I can see a shark circling. Somehow the thought of having it warmed over and served up again is less appetizing… time to let go, I think. This book was awarded the Canadian Governor-Generals Literary Award for Fiction, and I suspect that much of its appeal lay in the same sentiment that gave such acclaim to Kate Grenville’s The Secret River. here in Australia. Both books are based on a family ancestor, and in both cases there was an emigration to a settler colony. In both books, much of the story centred on the character actually reaching the new colony rather than what happened once they arrived- although less so in Grenville’s book. The Law of Dreams traces Fergus, a young boy orphaned through the Irish potato famine, and made homeless by the eviction of the tenant farmers by the farm overseer. He is sent to a workhouse, joins a gang of young marauding bandits, leaves for Liverpool, works as a navvy with tip ponies building railways and eventually leaves for America. The law of dreams is to ‘keep moving’, and this long odyssey is almost dream-like in its telling. The scenes in the famine are described in a rather detached fashion; people move into the slipstream of the story and then fall away quickly and the impetus is to keep going, keep going. I suspect that there’s a sort of writerly hazard in choosing to use one of your forebears as the main character in your novel. Perhaps there’s an inner imperative to remain true to the bare bones of the story- the ‘what REALLY happeneds’- and I think this limits the character development to a certain extent. Peter Behrens, it seems, is a screenwriter, and I think this shows in the book. The book is divided into several parts as the setting for the novel switches from place to place, and within each part there are many short chapters of two to three pages. To me, this reflects very much a screenwriter’s view where the camera-shot and cutaway can do the narrative leg work in shifting time and place. In a novel, though, I think it’s taking the easy way out to just start another chapter without having to narratively take characters and action from one place to another. This aside though, the journey was a compelling one and the book is well worth reading. The Resident Judge does not always sleep well. But one thing that will send her nodding off within minutes is the sound of voices on the radio, especially when they’re talking about something that she’d really be quite interested in if she…didn’t…drop…off…halfway..thr……. It is not really a practice to be recommended, though. Not only do I wake with the wires to the ear-buds wound several times around my neck, but I find that I really have very little memory of what I have heard. I think that the great plan of the 1970s to learn subliminally while playing information while you sleep was a pile of hooey- and certainly rather impractical if you had to wake yourself up to turn the tape over. Unless ABC Radio National has something that interests me, I listen to the BBC World Service which is rather repetitive because it has a news broadcast about every 15 minutes, but given that I’m usually asleep by the end of it, what I miss this time I will catch up with next time as my sleep cycle turns around again. It does lead to some rather garbled reception of what I’m hearing, though. Sometimes when I open the paper the next morning, I recognize a news story that I might have heard in snippets. I sometimes remember small details, but am not really sure enough of them to be able to vouch for their veracity. And sometimes- like yesterday- I’m actually able to check up on what I thought I heard and what I actually did hear. Early on Thursday morning, I heard what I thought was a fascinating workshop discussion about meditation in Christian and other religious traditions. The speaker, who was a Christian, led a guided meditation about darkness: the way that when you are walking in the dark, your eyes gradually adjust and you’re able to see things more clearly than you would have thought. I thought it was wonderful- I let him take me, and I was able to actually walk through the meditation with him. Then, I thought the Dalai Lama responded…and by now I was actually waking up, and I was so impressed with this guided meditation that I resolved to find out what the program was by looking up the Radio National website that day. Well, that’s what I thought I heard. Margaret Coffey: Paul Murray, who then took one of Johannes Tauler’s 14th century sermons to explore the Christian notion of searching for God in prayer. It was a sermon built around a reflection on a passage from St Luke’s Gospel. Paul Murray OP: Today’s Gospel, Tauler tells us, tells of a woman who has lost a coin and lit a lantern and searched for it. The woman in her great anxiety, Tauler informs us, turns her house up side down searching for the coin. But what, we might ask, does this searching mean? First of all it refers, according to Tauler, to the two most ordinary ways in which people seek God – an active way, which entails the external performance of certain religious practices and good works, and a passive way which entails a beginning journey into the innermost self. Tauler writes, we must allow ourselves to sink into our ground into the innermost depth and seek the Lord there, as he instructed us when he said the Kingdom of God is within you. Up to this point in his sermon we have heard for the most part about our searching for God but Tauler now goes on to speak about another more important searching. Earlier he had noted that it is eternal wisdom itself which has lit the lantern and now, he says, as soon as we enter our house to search for God, God in his turn searches for us – and the house is turned upside down. He acts just the way we do when we search for something, throwing aside one thing after another until we find what we are looking for. All of a sudden then we discover that the object of our search for God and of our search for wisdom is not some kind of passive divine truth, something which we are able to assess and possess with our own minds and at our own pace, but is rather something literally uncontrollable, a mystery of love our minds can barely begin to grasp, an urgency of attention to our most basic human needs and wants, a divine compassion and care for that very aspect of our lives which seems most hopeless and most lost. Where was my guided meditation? The light was there, and the darkness, and the looking…. but what had I done to it in my half-awake state? And yet, I felt so sure that I’d experienced it as a meditation- that I’d actually done the walking and the looking and the searching. Or maybe it was just a glass or two of wine too many before bed?